Group Membership: Formerly leader of her own criminal organization ("Angel", Jennifer, Jools, Jose, Peter, Simon, Vincent, Vivian, others) and of S.T.R.I.K.E. Base of Operations: London, England, U.K.
Powers/Abilities: As a human Vixen was a talented schemer, backed by a well-equipped criminal empire. As a fox, Vixen presumably has sharpened senses of smell and hearing, but her intellect is reduced, and she tends to be an extremely placid pet. Height: (fox, at the shoulder)1'2"; (human) 5'8"
Weight: (fox) 12 lbs. ; (human) 128 lbs. History: (Captain Britain I#3/1 (fb), BTS) - The Vixen was a female crimelord who rose to prominence in the U.K.. Her gang was equipped with high tech weapons and equipment, and though the police came to know of her, they had little solid intelligence about her. (Excalibur I#2 (fb), BTS) - Vixen controlled her organization with ruthless efficiency, feared by her men who knew that failure was rewarded by torture. (Captain Britain I#3/1 (fb), BTS) - her organization and name became well known to the police, but not her appearance or true identity. (Captain Britain I #3/1 - BTS) - The Vixen sent her men on a number of bank raids, arranging diversions to keep the police occupied elsewhere. During a raid the Chambers Street Bank, whose vault housed millions of pounds of gold, a silent alarm was set off. While the scheduled diversion succeeded in keeping the regular police away, it failed to take into account the armed CID flying squad led by Chief Inspector Dai Thomas, or the presence of new superhero Captain Britain, in the bank in his civilian identity. After assuming his costumed persona, the hero swiftly defeated Vixen's men. The only one still standing, the leader of the raiders attacked the superhero, stating that "Vixen is a lady who don't take kindly to people who get in her way." Unimpressed, Captain Britain finished off his opponent, informing the thug to tell his boss to expect him, "because I'll be coming after her next." (Captain Britain I#8/1, BTS) - A few weeks later another of Vixen's teams hit a different bank, but as they fled the scene they ran foul of Detective Inspector Kate Fraser and Captain Britain, and were captured. (Excalibur I#13 (fb), BTS) - The Vixen decided her ultimate goal was to become the U.K.'s self-appointed monarch. (The Daredevils#3/1 (fb), BTS) - Vixen's criminal espionage network began infiltrating S.T.R.I.K.E., replacing the people in the government agency's top positions with people loyal to the crimelord. Initially nobody was any the wiser, but inevitably the telepaths of S.T.R.I.K.E. 's Psi-Division discovered what was happening. They went on the run, and Vixen hired the American assassin Arcade to eliminate them. He subcontracted the job to another hitman, Slaymaster, who killed most of the group. (The Daredevils#3/1, BTS) - One of the survivors, Betsy Braddock, was the sister of Captain Britain, and called on his assistance to stop Slaymaster. The assassin cornered the remaining telepaths in London's Forbidden Planet comic shop and slaying a couple more of them, but the hero arrived in time to save Betsy and two others, Tom Lennox and Alison Double. (The Daredevils#4/1) - Vixen called Arcade to inform him of Slaymaster's defeat and berated him for supplying an incompetent operative, thus jeopardizing her plans to take over S.T.R.I.K.E. Arcade reassured her he would deal with the problem personally (then utterly failed to do so). (The Daredevils#9/2 (fb), BTS) - Vixen swiftly consolidated her control over S.T.R.I.K.E., presumably to ensure that it wouldn't matter even if the surviving psis exposed her actions. (The Daredevils#9/2) - Vixen took a phonecall which she initially believed to be from Arcade, but discovered to her shock that the caller was a stranger (Sir James Jaspers, who only identified himself as a "cheekier chappy" than Arcade). The caller told her not to bother asking how he had gotten hold of her number, and, much to her disquiet, revealed he knew she now controlled S.T.R.I.K.E. When she asked for his name, he declined, telling her it wasn't important; instead, the caller insisted that what was important was that S.T.R.I.K.E. were going to receive direct orders within the week from the British government, ordering them to eradicate all superheroes. Telling Vixen to prepare herself for this, the caller hung up, leaving Vixen staring thoughtfully at the phone. (Mighty World of Marvel II#7/2 (fb), BTS) - Jaspers was elected British Prime Minister. Vixen's armored "Beetle" troops, many of whom knew who they really served, captured much of Britain's superhuman population, using scanning devices, patrols and random roadblocks. Even those with only questionable abilities, such as scoring marginally highly in "card reading" ESP tests in schools, were arrested. Concentration camps were set up, and Beetles patrolled the streets of major cities. (Mighty World of Marvel II#8/2, BTS) - With access to S.T.R.I.K.E. 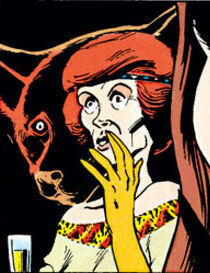 's files, Vixen sent a Beetle team to investigate the supposedly bombed out Braddock Manor. They were slain by the Fury. (Mighty World of Marvel II#8/2) - Jasper's influence saw the passage of time distorting around the British Isles, with those trapped within the increasingly dystopian U.K. feeling like months had passed when only a few weeks had. Vixen began feeling Jaspers had gone too far, worried that the U.S.A. and Russia would not stand by as things worsened, or that his increasing excesses would draw S.H.I.E.L.D. or the Avengers' attention. Feeling she had put too much work into eliminating the heroes and taking over S.T.R.I.K.E. for Jaspers to ruin things, she decided to personally assassinate "Mad Jimmy." Accompanied by two of her operatives, Jennifer and Angel, the latter of whom she seemed to be genuinely fond of, she broke into 10 Downing Street (home of the British Prime Minister), but was off-footed to find Jaspers waiting for her, aware of her plans, visibly even more insane than she had realized ... and able to warp the very fabric of reality at his whim. Vixen hastily ordered Jennifer to shoot Jaspers, but Jaspers slew both agents, then switched his attention to Vixen. Scared, she tried to make a deal, but Jaspers dismissed her entreaties and transformed her into an actual vixen. Terrified, she would have screamed...had she remembered how to do so. (Mighty World of Marvel II#9/2) - Shortly after this, and with the reality breakdown rapidly escalating, Captain Britain arrived, likewise intending to confront Jaspers. As he entered Number 10, he passed by the fox, which was foaming at the mouth, apparently insane. (Captain Britain II#3/1 (fb), BTS) - Jaspers was slain, and many of his victims reverted to normal, including Vixen. She retained a nightmarish vague recollection of her ordeal. S.T.R.I.K.E. was discredited, and dissolved, but Vixen still controlled her own organization. (Captain Britain II#3/1) - Vixen celebrated her birthday in an underground base, dressing in a Wild West themed outfit with red hair. Coincidentally, on the same day, Slaymaster captured Captain Britain and delivered him to the base, hoping to collaborate with the crimelord. Upon hearing what day it was, Slaymaster made a gesture of presenting the defeated hero as Vixen's present. She told her men to store the hero in a cell, and to have his power-enhancing costume delivered to the labs for analysis. Playing the genial host, she took a drink for herself but, aware Slaymaster's religion forbade alcohol, asked if he wanted another kind of stimulant instead, then asked him to entertain her with the story of Captain Britain's capture. Upon hearing that he had used the Crazy Gang to lure the hero into an ambush, she praised his ingenuity but chastized him for leaving the Crazy Gang running loose now he had finished using them. The pair noticed on a monitor screen that the captive had woken up and was angry, and Slaymaster asked his hostess where the costume was, telling her that while she was welcome to the man, he wanted the costume for himself. Smiling harshly, Vixen asked Slaymaster what made him think he was in a position to want anything. As Slaymaster spluttered angrily that he was not one of her serving boys, Vixen told him he was whatever she said he was, and ordered her men to take Slaymaster prisoner. Teasing him for his naivety, she informed him that once her scientists had finished examing the suit, she might get one made for herself, but that he was too dangerous already even without a suit. Leaving Slaymaster watched by two of her guards, Vixen changed into a negligee and to magenta hair, then visited Captain Britain, enjoying his rage. She slapped him for threatening her, telling her restrained captive he was now hers to do with as she willed. When the hero asked what she wanted from him, she told him to lean closer, so she could whisper it to him; watching over the monitors, Slaymaster was disgusted by her mistreatment of an honorable foe, and overpowered the guards. Departing the cells, Vixen changed into a fur-lined red dress and blonde hair, and summoned a scientist to her to brief her on what the lab had learned about the hero's costume, listening with unconcealed glee as she was told of the powers it granted its wearer. The briefing was interrupted by the arrival of the guards she had left with Slaymaster, coming to inform her that the assassin had overpowered them and escaped. Checking the video feed from Captain Britain's cell, she saw that the hero was free and donning his costume, reclaimed from Slaymaster who had in turn reclaimed it. Aware he was on camera, the hero informed Vixen he would take her base apart brick by brick until he found her, then he would exact revenge. Taking his threat seriously, Vixen decided to cut her losses and ordered the cells flooded, washing the hero out into the sewers. (Captain Britain II#13/1 (fb), BTS) - Brian Braddock retired from being Captain Britain and was replaced by Betsy Braddock, working for S.T.R.I.K.E. 's successor agency, R.C.X. Deeming them obstacles to her long term plans, Vixen made peace with Slaymaster, and used her technicians' research to create an enhancing costume attuned to him. Vixen then kidnapped two R.C.X. agents and a truckload of Warpies (children mutated by the Jaspers' Warp), holding them hostage to force the new Captain Britain to come to the South Bank building site on the Thames. (Captain Britain II#13/1) - In a pinstripe suit with magenta hair, Vixen sat sipping a chilled drink as Betsy arrived and was confronted by Slaymaster. When Betsy called Vixen a hag, the aging crimelord lost her temper, screaming at Slaymaster to rip his opponent apart. Vixen watched as he beat Betsy, then blinded her by gouging out her eyes. As Slaymaster hoisted his beaten foe aloft, demanding to know where the previous Captain Britain was, Vixen told him to give it a rest, then took hold of Betsy's costume, telling her to make it easy on herself. Instead Betsy called her a hag again, telling her to go to Hell. Enraged, Vixen let Slaymaster take over again, ordering him to make his victim beg to die. Slaymaster began beating Betsy, but the group paused as they heard a high-pitched whistling noise approaching; seconds later, Brian Braddock flew in, breaking the sound barrier as he punched Slaymaster. Deeming it time to leave, Vixen and her men fled, with Vixen pausing at her car only long enough to glance back and confirm that the berserk Brian was still hitting Slaymaster. (Captain Britain II#13/1, BTS) - Vixen disposed of the hostages. (Excalibur I#2 (fb), BTS) - Learning of a young Scottish mutant, Colin McKay, Vixen had her men kidnap him, but he escaped. Blaming one of her men, Vixen did something horrible to him to set an example for the rest of her agents not to fail her. (Excalibur I#2) - Her men pursued Colin to an abandoned Loch Daemon factory, but lost him there. In a safari suit and sporting white hair, Vixen took the news with frosty displeasure, and promised that by the time she was done with the squad who had lost the boy, they would wish they had vanished with him. (Excalibur I#3) - Vixen was offered a million pounds to break into Crossmoor Prison and free a prisoner from his cell. Vixen led the raid, clad in a prison-arrowed yellow suit and with magenta hair again. Her agents easily got into the prison, but when Vixen entered the cell, she found it was empty. Armed police emerged from hiding, revealing it was a trap. Refusing to surrender, Vixen had her men shoot out the lights, then they retreated, exchanging fire with their pursuers, with Vixen promising to repay whoever had informed on their mission. Seeking refuge, they entered a cell that proved to contain the Juggernaut. They released him to tackle the army forces now gathering outside, his ripping down walls freeing multiple other criminals as a bonus diversion. Vixen and her agents then fled while the army was occupied. (Excalibur I#21) - Vixen was contacted by Nigel Frobisher, who made it clear he wished to make an "offer she couldn't refuse." Intending to eliminate the potential threat, Vixen (clad in a red suit and with magenta hair) and her men met with Nigel in Hyde Park, but found him accompanied by the clearly insane Jamie Braddock. When Nigel made it clear he intended to take over, the unimpressed Vixen had her men open fire, but Jamie revealed he possessed reality warping powers, saving Nigel and imprisoning Vixen's guards. She attempted to flee, but Jamie transformed her back into a fox, which he took as his pet. Jamie gave Nigel the power to assume Vixen's human appearance, enabling him to take over her organization on behalf of his mistress, extradimensional tyrant Sat-Yr9. (Excalibur I#27) - Vixen stayed in Jamie's London townhouse, watching as her master learned that the superhero team Excalibur had returned from a period of interdimensional exile, and as he modified a TV set to watch what they were doing. (Excalibur I#56) - Sat-Yr9 and her agents, including Jamie, defeated Excalibur and their allies and held them captive at Braddock Manor. Still a fox, Vixen sat on Jamie's lap while her master slumbered. She watched as Shadowcat subsequently made an unsuccessful attempt to overpower Jamie, then witnessed Meggan do so successfully. Battle ensued between the freed Excalibur and Sat-Yr9s forces, until the latter elected to flee once both Jamie and Sat-Yr9 were incapacitated. Vixen followed as Jamie was carried into an escape vehicle, which rapidly flew away despite Captain Britain's attempts to stop it. 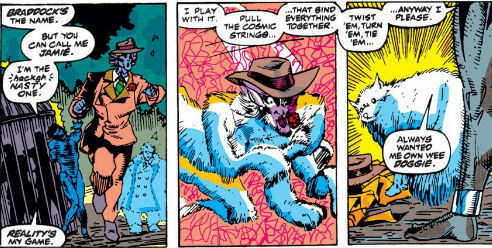 Comments: First conceived and mentioned by Chris Claremont; developed and first depicted by Alan Moore and Alan Davis. Vixen's fur was white in Excalibur #21 and 27, but red-brown in Excalibur #56; presumably Jamie changed her fur colouring between stories.